April 2nd is Equal Pay Day 2019, representing how far into the next year women must have worked in order to earn what white men earned the previous year—but while this statistic is true for the average white woman, today is not Equal Pay Day for everybody. For women of color and disabled women, the wage gap is even larger, and their corresponding Equal Pay Days are even further into the year. Here, HG contributor Candace Ganger, a writer, mom, and woman of color, describes the numerous side hustles and part-time gigs she is forced to juggle just to make ends meet. Mark these 2019 #EqualPayDay dates in your calendar! The pay gap is far wider for women of color and disabled women, and for moms as compared to dads. I’m a professional writer. I love what I do. Writing has, in many ways, saved my life, and I don’t say that as an inspirational anecdote. As someone who struggles with depression and anxiety, I often turn to a blank page before reaching out to living, breathing humans, because it’s become synonymous with non-judgmental comfort. There’s something about a bare canvas that reflects back to me all the things I hold inside, letting me somehow make sense of the tangled mess. But writing for a living means working multiple full-time jobs. I don’t just say that as a writer, but as a woman, and as a woman of color. I often find myself doing the strangest things to stretch a paycheck to buy toilet paper or bread; sometimes more than my male counterparts. I hate to say it, but I have to rely on multiple side hustles to get by, and it’s unfair and detrimental to my physical and mental health. 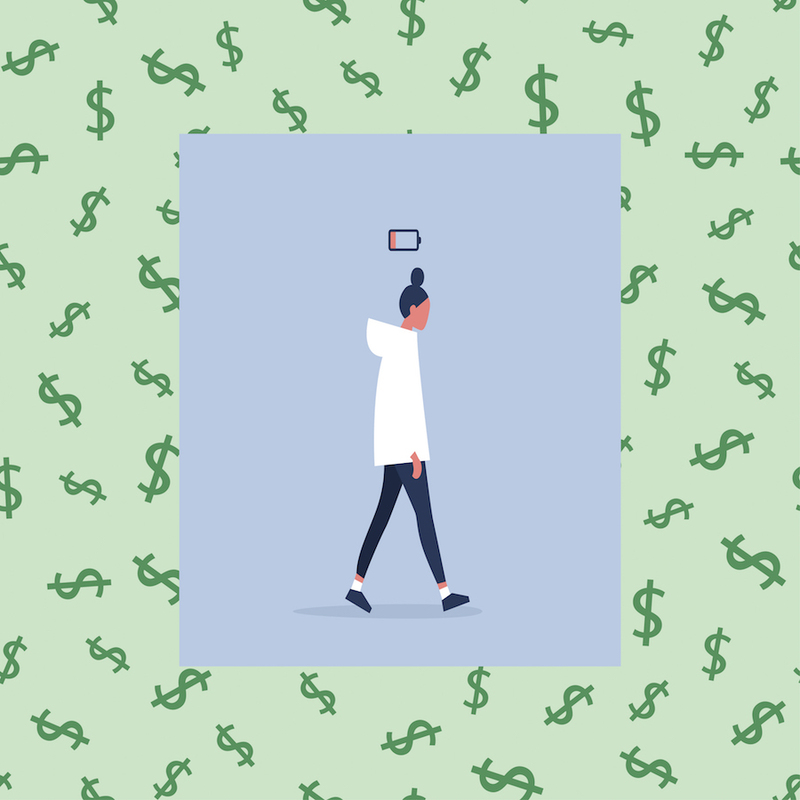 Anyone who works in creative fields or digital media knows that it often means long, arduous hours for little pay, and sometimes—specifically as a woman, and one of color—less respect. My staff position aside, I’ve freelanced for nearly 12 years, and throughout that time, it’s become apparent that working in a creative field is often seen as less than. Art is valued far less than the work of someone who codes or even my husband’s work as a line tech for a cable company. Art is often viewed as a hobby—not something you build your career around and definitely not something you depend on for money. I’ve had many clients refuse to pay my worth or for my time, and some (all successful men) have avoided paying me at all. They didn’t care how badly my newborn son needed his special GI formula that cost more than our water bill each week or that I battled severe postpartum depression that required expensive medications and therapies for me to survive. And they certainly didn’t care that a “measly” $60 article meant the difference between our electricity staying on, or not. I don’t know why working in a creative field is treated as a “fun, whimsical” extracurricular when it’s my livelihood; how I pay my bills and support my children. In addition to writing every possible type of content you can imagine, I’ve had to think outside the box to fill in the wage gaps, whether those gaps were due to embarrassingly low pay for a specific job or the patriarchy. For instance, I participated in a clinical research trial weeks after the birth of my daughter. The meetings ate away at my time and paid very little, but that small check (and free depression medication) meant that we could breathe a little. I’ve pawned my engagement and wedding rings to buy diapers and formula; my kids didn’t care what I had to do to get those things—they just knew that they needed them. I’ve sung on street corners for donations. I’ve cleaned houses, babysat, and sold vacuum cleaners on commission. I’ve taken part in every “at-home” business (Avon, Mary Kay, Scentsy, etc.) to pay the bills without completely sacrificing time away from my kids my writing. Cash advances? A regular thing. Credit? Yep. Overtime? I’ll take it. Write an insane number of things with a 24-hour turn-around time for a fraction of what I’m worth? You got it. If you can think of a (legal) side hustle, I’ve probably done it. I work seven days a week. I work on vacations and days “off.” We live modestly and yet, all of this work simply isn’t enough to cushion us from any unforeseen fall. And so I have to work and keep working. It’s the only way. My husband, from whom I’m currently separated, works a full-time job, but once you calculate taxes, insurance, 401k contributions, and various other expenses taken from the gross amount, there really isn’t much left. It is the same for my paycheck, but with even less hours allotted. Have you ever taken the time to track all of your paycheck’s deductions? It’s a hard reality check. For over 12 years now, I’ve been the full-time caregiver for our children, despite forging my own path and career through writing. It’s not “spare” time, but endless hours that add up to sleepless nights and early mornings while fitting in staff hours in the position that won’t let me work over a certain amount of part-time hours per week—and still showing up for my kids as needed. I remember holding my newborn son at 4 a.m. while editing an e-book I agreed to work on in the early weeks after his birth. All of this to say, I’ve done a lot of things to make sure my kids don’t feel the discomfort of poverty I felt growing up—though, I know sometimes, they still do. They’ve watched me count change to pay for groceries or make calls to plead for an extension on a bill. They’ve overheard me asking for a fee for the rent I knew would be late. My 7-year-old son has outgrown his clothing; my daughter, 12, outgrows her clothes even more rapidly. “Next check I’ll get you a few new things,” I tell them every 2 weeks. They know most times, it’s a stall; a lie. Because regardless of whatever extra work I’ve taken on, it never seems to be enough. If you’re reading this and thinking, “just get a normal job,” then do I have bad news for you. When you spend so much time filling the cracks of a resume with sporadic work, it may amount to a great deal of experience and lessons learned, but employers look for a steady history. And even if you’re hired, it doesn’t mean that a “normal” job will pay nearly anything worth the hassle of being there. I worked at a local running shop for over two years on minimum wage. It was great. My workmates became family. But the gas it took to be there, plus the time away from my kids and the expenses incurred because of it, caused a deficit in our finances, not an increase. Despite the pushback from some—because it’s more acceptable to work a “normal” job that causes financial deficit than to pursue a dream that could, at some point, pan out—I left that job to pursue writing full-time, determined to make it work, somehow, someway. Months later, when I’d all but given up, I sold my first two novels, wrote enough high-profile freelance pieces to catch up on bills, and acquired a remote staff position, writing. Multiple avenues towards one goal: doing the thing that makes me happiest (writing), but still making a living. I could’ve chosen a different path, but to do so would have meant compromising who I am and what I know is my purpose. It’s been grueling, balancing all the different jobs while caring for my kids, but honestly? Worth it. If you need a side hustle to make ends meet but love what you do, so be it. Of course, I wish that writing alone paid enough, but for me, right now, that just isn’t so. Maybe someday, art will be valued at what it’s worth instead of some sliding scale judged by those who have no idea what it takes to create something from nothing. The inner workings of someone’s mind to a blank canvas or page is a gift to the world, an offering of the heart. It’s invaluable. Today is #EqualPayDay, marking the day when women’s earnings catch up to men’s earnings for the prior year. Someday, I hope to eliminate all side hustles so that I have the ability to give my gifts without sacrificing other things in its wake. Equal pay for the work I’ve poured myself into seems fair. In the meantime, I guess I’ll keep on keepin’ on however I can. Even if it means I may not sleep tonight in exchange for one more piece (like this one!). Because sometimes, it’s not just about the money—it’s about saying I was here. See me; mark my words; don’t forget them. That’s the real dream anyway—to do something that means something. So, to all of you with side hustles wondering if it’ll all be worth it, let me tell you: I don’t know. I do know the time and pain of side hustles is far less excruciating than sacrificing who you know you were meant to be. So take that and run with it.